Here's how the "It's Your Turn in the Hot Seat" program was created. 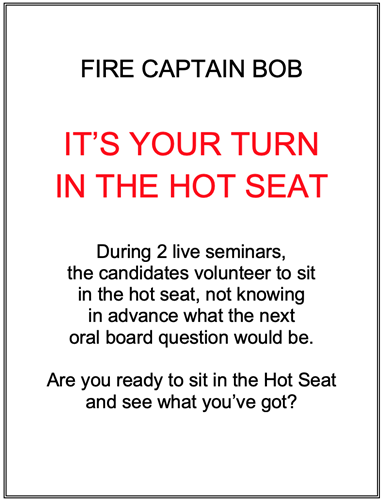 During two live seminars the candidates volunteered to sit in the "hot seat" not knowing in advance what the next oral board question would be. Everyone quickly learned what they thought was prepared and unique fell short of getting top scores, especially those candidates who volunteered to give it their best shot. You won't believe what these, I thought I was ready, candidates said! This also applied to many in the packed room who gave their .02 cents as the questions were opened up to the attendees. You've spent time, money and put your life on hold to gain the necessary education and experience to become a firefighter. Your oral board will determine the future. It's game day. You have around 20 minutes to stun the oral board into giving you the opportunity to ride big red. Are you ready to sit in the hot seat and see what you've got?